A birthday tradition is something that is done for kids, tweens, teens and even adults that is done year after year so that it becomes a part of your families celebrations and that is looked forward to all year! These fun ideas for birthday traditions will make boys and girls birthdays even more special for the ones you love! Start new fun birthday traditions this year for your child that will bless them and make their day even more special. These easy, inexpensive and great ideas for moms and parents that can be used for children of all ages. Choose one, two, three or more of these fun ideas! Start a new tradition for all the birthdays in your family! A great tradition for kids is making a fun breakfast to celebrate first thing in the morning. 1. Funfetti pancakes and top with a candle. 2. Arrange refrigerated cinnamon rolls on a pan into the number that corresponds with the birthday age. Bake as usual. Add candles for more fun! 3. Doughnuts stacked with a candle. 4. Pancakes made into the shape of the age of the birthday. Pour the pancake batter onto the pan in the shape of the number. 6. Cake Sprinkles make everything festive! Sprinkle them on pancakes, cereal, oatmeal, doughnuts or whatever you are having for breakfast! 7. Add some candles to their stack of pancakes or doughnut! Another fun birthday party tradition is to give the birthday child the number of presents that matches their age. If a child is turning 7 then they would receive 7 presents. The presents don't have to be expensive items. For example one of the presents could be a candy bar or small inexpensive toy. Kids, tweens and even teenagers look forward to this tradition. Every year ask the child these 20 questions and write down their answers and their age. Store them together and read them when they are 18 or 21. Or make a scrapbook and include the interview for each year. 1. What was your favorite day this year? 2. What is your favorite joke? 3. What good deeds have you done this year? 4. How do you feel about your brother/sister today? 5.What do you want to be when you grow up? 6. Where is your favorite place to be? 7. What's your favorite thing about your dad? 8. What's your favorite thing about your mom? 9. What fears do you have? 10. What's your greatest talent? 15. What is your favorite color? 16. What is your favorite candy bar? 17. What is your favorite holiday? 18. What would you buy with $1,000.00? 19. What is the price of a new car? 20. 1 thing you want to accomplish this year? 21. What would you rename 1 family member? 22. What is easy for you to do? 23. What is hard for you to do? Decorating and setting up surprises around the house is lots of fun and a great birthday tradition. It can be the same thing every year or something new and different that they can look forward to when they wake up. After they go to sleep for the night decorate the kitchen table with balloons, streamers and a happy birthday sign. Then serve them a special breakfast when they wake up! Decorate the house with helium balloons on the ceiling and regular balloons on the floor, streamers, signs, and funny quotes. Colorful tablecloth on the kitchen table makes everything festive. On the day or the birthday or that week let the child spend some time helping others. Volunteer at a food bank or animal shelter. Let them buy an item to donate to a charity. Help them make cards for sick children that are in the hospital on their birthday. Write a funny message or simply "Happy Birthday!" on the bathroom mirror with a Dry Erase marker. "Honk for Billy's 7th Birthday!" Blow up lots of balloons after the birthday child goes to bed. Use streamers or string to tape across their closed door leaving a little slack in the streamers so there is room for the balloons. 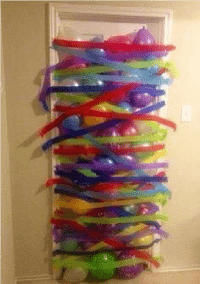 Fill the space between the closed door and the streamers with the balloons. Another way is to buy a clear plastic shower curtain taped to the door frame with painters tape. Fill space between the curtain and door with balloons. Keep the shower curtain to use year after year. When the birthday boy or girl wakes up in the morning and opens their door the balloons will fall into their room like an avalanche! Be really quiet while setting this birthday tradition up! Hang balloons from curling ribbon from the door frame of the birthday child's room. When the birthday boy or girl wakes up they get to walk through the hanging balloons! Add a Happy Birthday sign or a door sign for more fun! Make a sign for the birthday boy or girl out of butcher roll paper or poster boards. Hang on their bedroom door during the night or hang up in the house to surprise them on their birthday. Include accomplishments from the past year, scripture verses, a poem or pictures of them throughout the past year. This sign gives the months, weeks and days of how old they are ... and how many days they have been loved. Children of all ages love a treasure hunt and nothing is better then having one on your birthday! Hide the presents in a secret spot (or lock them in a trunk and hide the key for them to find!). Make up clues that lead from one clue to the next and finally lead them to the gifts. A trick is to start writing the clues from where you hide the presents and working backwards to the first clue. Variation: Hide the presents and write down the location on the back of a small puzzle. Break up the pieces of the puzzle and hide the pieces (we put them in plastic eggs!) around the house. When they collect all the pieces they can put together the puzzle and find out where the presents are hidden! The night before the child's birthday write them a letter. Be sure to include what age they will be celebrating. Include special things they have done in the past year, your hopes and dreams for them and how special they are to you. Seal the letter and store it away. Keep all the letters together and present them to your child when they are 18 or 21 years old. This is a fun birthday tradition. After the party fill a small plastic box container with items from their birthday party. Invitations, guest list, receipts, cards, photographs, party theme items, candles, etc. Write the child's name and age on the box, seal it and store it away. Do this every year while they are growing up and present the time capsules to them when they are 18! Choose a spot in your house (or purchase a measuring poster to hang up) to mark the measurements of the child. Mark the spot on the wall (or poster) with their name, date and age. This is a fun and silly birthday tradition that will make your child feel extra special while they are at school. Individually wrap all the lunch items in wrapping paper! Don't forget a bow or tag on each item. Kids love this unique and funny birthday tradition! Buy a special plate and let the child use it on their special day. They get to use it for breakfast, lunch and dinner! A simple tradition, but one that kids look forward to year after year! Take a special photograph of your child every year on their birthday. Use the same prop for every year. It might be a special party hat or a special place that the photo is taken, but make sure it's the same for each year. This is a fun tradition that makes growing old fun, and profitable! Create a birthday fairy container (decorate a small box or bank) for each birthday child. Fill the container with a quarter for each year of the child. (Or $1.00 per year ) Set the container next to the child's bed during the night so when they wake up they will see that the fairy has visited them! Let them have the choice of what they will have for dinner. Whether it is a dinner made at home or their favorite restaurant they get to pick! If you have dinner at home eat in the dining room on a fancy tablecloth with the best china and candles to make it special. Make the day special by always going to a favorite restaurant or doing a fun activity such as bowling or ice skating. This is a fun idea that can grow with the child. Let them know how special they are by writing positive things about them on balloons that are scattered throughout the house (this would work especially well with the balloon avalanche - see above). Another great way to let them know how special they are is to go around the table at breakfast or dinner and have everyone say 1 thing about what they love about the child. 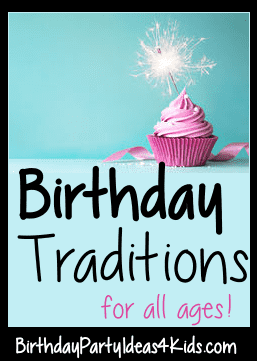 Start birthday traditions for toddlers, kids, tweens and teens at any age. Most of all birthday traditions make our children feel loved and give them something to look forward to year after year! Start some simple birthday traditions for your family and you'll see them passed down to your grandchildren. Start here to plan a birthday party with a great kids birthday party theme!